Is Sitting the New Smoking? Is Sitting the New Smoking? Sitting at your desk, for extended periods of time, can land you that big promotion, but it may also lead to diabetes, musculoskeletal problems, heart disease or even an early grave. All the time we spend sitting behind a steering wheel, slumped over a keyboard, or kicked back in front of the television, has been linked to increased risks of heart disease, diabetes, cancer, and even depression. A study, published in the journal Diabetologia, compared the health of people who spent the most time sitting with those who spent the least time. The results found an increase in the risks of diabetes (112%), cardiovascular events (147%), death from cardiovascular causes (90%) and death from other causes (49%). Our bodies weren’t designed to accommodate a position that decreases the blood flow to our legs and feet and contorts our spine. Our bodies have become less flexible, and researchers say that the decreased reliance on bodily movement has us paying a heavy price. If you’re sitting, the big muscles in your legs and back are not contracting. This inactivity causes cholesterol levels to go up, metabolism to slow, blood sugar levels to spike and triglycerides to rise. An Australian study, published in the British Journal of Sports Medicine, in October 2012, analyzed how two common pastimes effect life expectancy. They found that for every hour of TV that people watch, presumably while sitting, it cuts about 22 minutes from their life span. By contrast, it’s estimated that smokers shorten their lives by about 11 minutes for every cigarette they smoke. 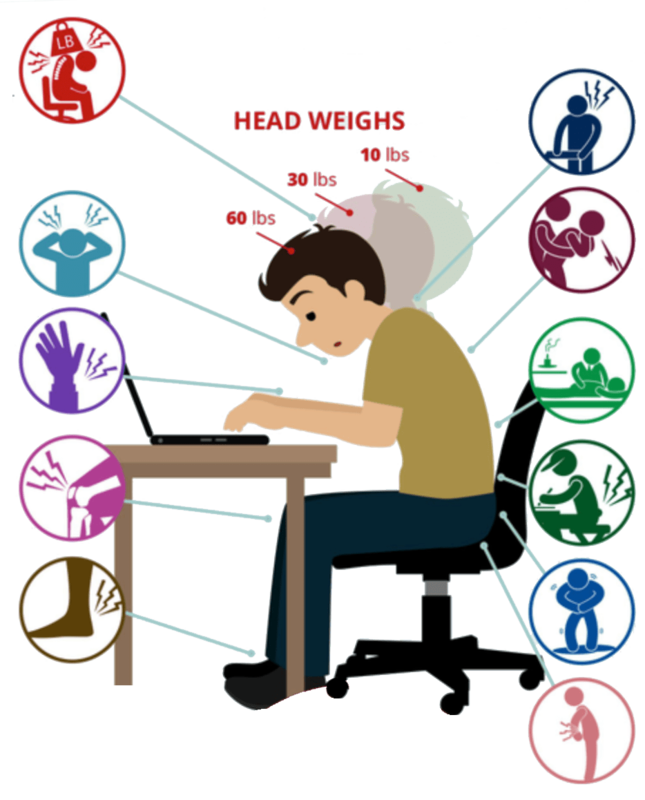 Here are some examples of what sitting will do to your musculoskeletal system. 1. Neck Problems: Hunching over your phone or at your desk puts an additional 60 lbs of pressure on your spine; causing wear and tear to your spinal cord, disc degeneration, herniation, surgery, nerve damage, headaches, compromised shoulder function and compromised athletic function. 2. Carpal Tunnel Syndrome: Sitting with rounded shoulders with poor neck position can cause compromised nerve movement and collapsed nerve tunnels, which can cause carpal tunnel syndrome. 3. Knee Problems: Too much sitting can lead to shortening and tensioning of the quadriceps and calves, which can lead to mechanical knee pain. 4. Shoulder Dysfunction: Slumping over in a chair creates inwardly rotated shoulders, which can cause shoulder impingement, rotator cuff dysfunction, instability, and general shoulder pain. 5. Poor Diaphragm Function: A rounded, or over extended sitting position can lead to compromised diaphragm function, which results in poor breathing patterns, decreased spinal stabilization and increased stress in breathing patterns. This can can lead to poor sleep, poor fat metabolism, exacerbation of breathing disorders (asthma), a compromised ability to down-regulate at night and even early death. 6. Low Back Pain: Too much sitting is the root cause of non-specific low back pain, stenosis, and disk pathology. 7. Hip Dysfunction: It is not natural for your hip to be at a 90 degree angle all day. Sitting causes compromised hip function and impingement, which leads to osteoarthritis, shortening of tissues, and compromised athletic ability. No matter how good your positioning, it is important to get up every so often. I recommend breaking up sedentary time for at least one to two minutes every half an hour. Arrange your work so you can sit or stand comfortably in a position that does not put stress on any specific area of your body. You should be able to keep your neck in a neutral position and minimize the need to look up or to the sides continuously while you are working. Eliminate most movement from your waist. Keep the workstation and workstation tools within easy reach. Avoid having to lean, bend or twist at the waist too often. Vary postures when possible. Take 10 to15 second breaks, frequently throughout your task. For example, look away from your computer monitor, stand up, or stretch your arms. Short breaks reduce eyestrain and the buildup of muscle tension. Stretch your body by getting up out of your chair and stretching your arms, shoulders, back, and legs. When you are sitting, shrug and relax your shoulders.